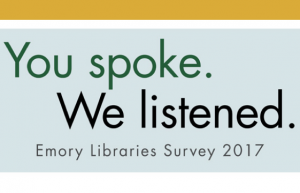 The You Spoke/We Listened campaign continues in November and December with a focus on how the Libraries can help you with your classes. Many of you told us you aren’t aware of all the resources and services the Libraries offer. The Libraries’ Outreach and Education team has developed a new research guide called Find It, Use It, Get Help. This guide provides a list of key library resources and services. Check it out to see what you’ve been missing. Bookmark this page for a quick, at-a-glance list of available resources and services.